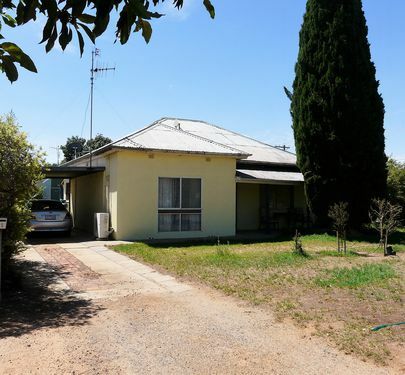 Here is a truly brilliant property on a 5094m block in a sort after estate with a sensational rural outlook, less than 2km from the main street of Tocumwal. 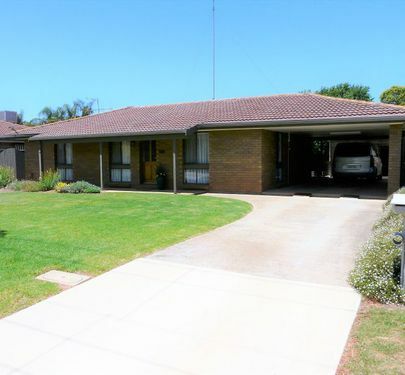 The house comprises of 2 huge sun filled living areas, open plan living, dining and kitchen with large pantry, plus separate formal lounge room and an extra family room/study. 3 bedrooms with BIR's and ceiling fans. Main bedroom also features a huge WIR and ensuite with spa bath and double shower. 4 split systems ensure all year round, fuss-free comfort. Outside there is a double car garage, 4,500ltr water tank, bore, 6x9m paved & undercover entertainment area and an excellent 18x9m shed with wood fire, power and lighting. Perfect for a workshop or to house all your toys. Established gardens and trees complete this beautiful family home. If this sounds like the home you need, call us today for an appointment to view. 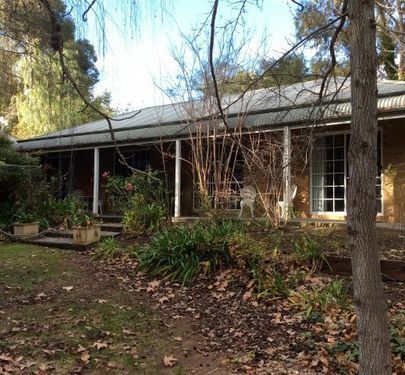 If you are looking for the perfect rural lifestyle but do not want to be too far from town, then this is the property for you. 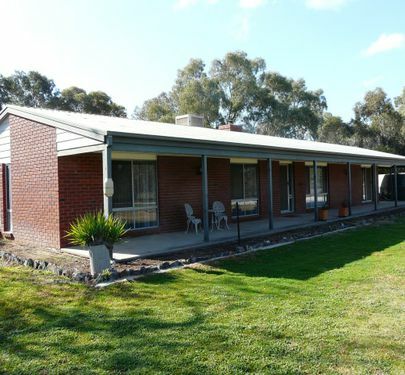 Situated on 4.6 acres this 3 bedroom brick veneer home is only 5 minutes from the centre of Tocumwal. The kitchen is part of an open plan living and dining area and has gas cooktop, electric oven, dishwasher and large pantry. 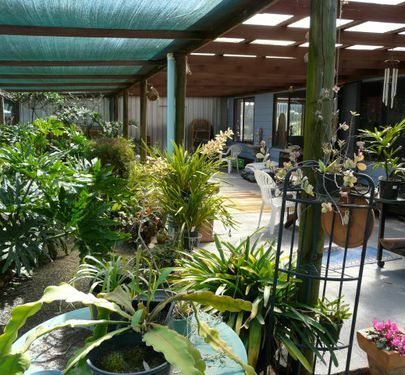 The dining area has a large coonara for warmth in the winter, then walk through to a second large living area to really spread out and enjoy the comforts of this home. 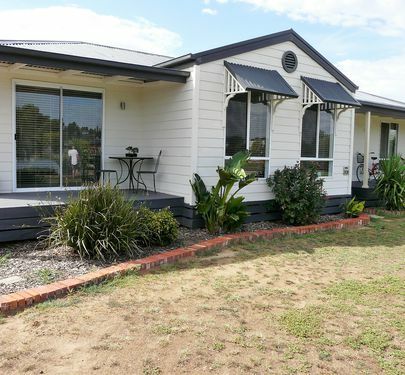 The main bedroom has an ensuite, walk in robe, tv & phone connections, the remaining 2 bedrooms have built in robes and all have ceiling fans. 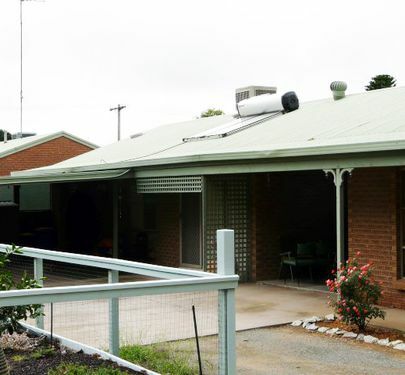 The home is cooled by ducted evaporative air-conditioning and a split system and along with the coonara there is a gas heater for extra heating. 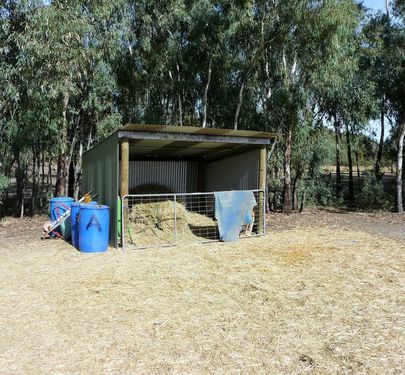 Outside you have three sheds a 10 x 6m, 6 x 6m and 4 x 9m all with power & lighting, front and rear automatic sprinkler systems for the home and bayonets in the paddocks, established gardens and well treed sheltered paddocks. Call us now for an inspection. Hobby Farm - Owner says SELL! 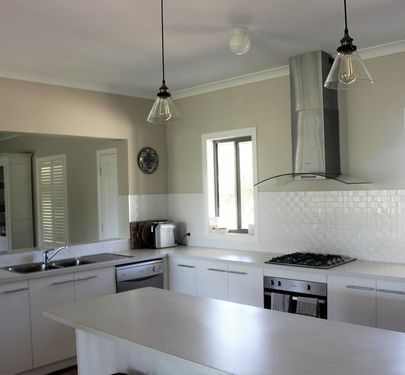 Unique opportunity to purchase a Murray River country lifestyle property on 4.5 Acres, featuring a 3 bedroom home with ensuite and walk in robe to the master bedroom, well appointed kitchen with dishwasher and extra bench space, main lounge with exposed brick feature wall with built in coonara, second lounge and formal dining and all cooled through ducted evaporative cooling. North facing insect proof 8x3m sunroom and BBQ area, lush garden setting all serviced with clean bore water. 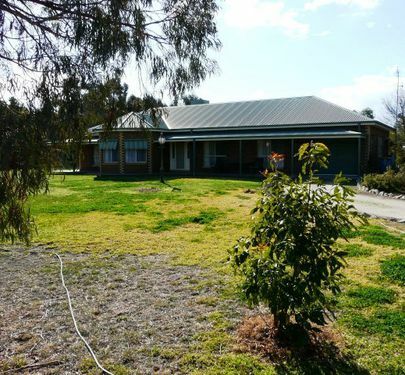 Well-developed block with 2 separate tree lined paddocks with a loose box, cattle yards and ramp, 20x8m shed plus a 10x4m shed, water tank and a fabulous irrigated olive plantation in the 3rd paddock. 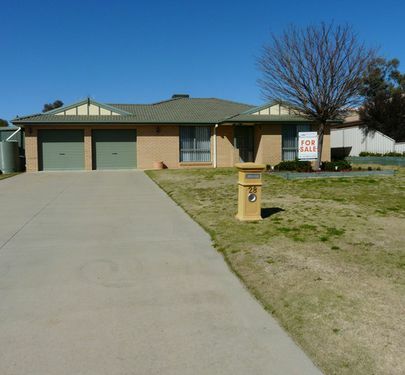 This property is a must to inspect and in a desired part of Tocumwal. Owner says sell with price negotiable. 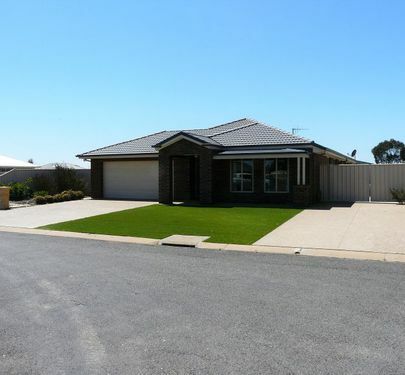 A great 4 bedroom home set among the gum trees on the outskirts of town! 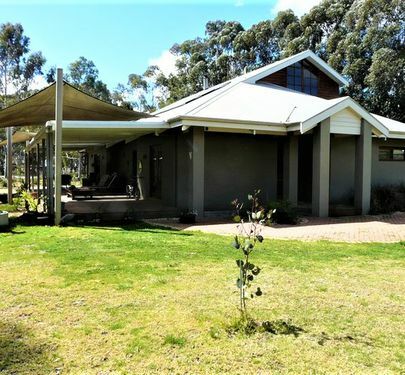 This beautifully presented Dennis Family home was built in 2012 and is set on 1400m2, the total area is on 2 separate land titles, one title for the home block and the second for the adjoining block. 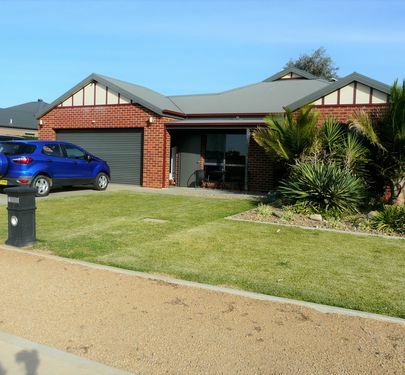 The 4 bedroom brick veneer home is full of modern conveniences that you would expect from a new home. The main hub of any family home is the kitchen, dining and family area which in this home is open plan, the kitchen consists of gas cooktop, electric oven and rangehood, dishlex dishwasher and a large pantry, the kitchen then flows into the dining and living area, you also have double sliding door access to the outdoor entertaining area. The main bedroom, which is uniquely situated at the back of the home has ensuite and WIR, the other 3 bedrooms all have built in robes. The main bathroom has shower, bath, vanity and separate toilet. At the front of the home you have a second living area that you can hide away for quiet time. Keep comfortable in the summer with ducted evaporative cooling and ducted natural gas heating for the winter months, for added comfort you have a split system in the open plan living area. Moving outside you have a 4 x 8m outdoor entertainment area that overlooks the garden and the second block and as mentioned is on a second title that you can add your own improvements or sell off at a later date with no sub-division required. Plenty of car space with double lock up remote control garage and you also have an area to the side that has enough room for caravan or boat parking. Connections are already in place for NBN, Foxtel and keep your electricity costs down with 3kw solar panels.Call Rob Crow & Co Real Estate today to arrange an inspection on this great home. 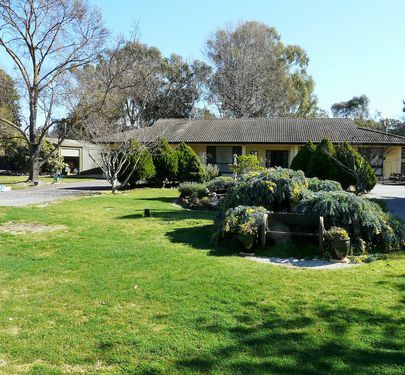 Inspect and envision yourself in this magnificent property looking out over our beautiful Tocumwal Golf Course. Located in a quiet part of town on a large 920m2 block this 3 bedroom home features a well appointed kitchen with electric cooking, dishwasher and walk in pantry located in the hub of the home including you in the lovely open plan design, natural gas log fire as a comforting feature in the lounge room, ducted gas heating and ducted evaporative cooling throughout the home, ensuite and walk in robe in the master bedroom and built in robes in the remaining 2 bedrooms. Outside creates a "wow" feature with a huge semi enclosed deck with ceiling fans for the entertainer, a garden shed which doubles as "Golf Buggy House" complete with a ramp down to the golf course, landscaped rear yard and sprinkler systems at the front and rear of the property. Remote double car garage with an extensive work bench area along 1 wall. This property has it all for the keen golfer or indeed the family for extra room to run around. Give us a call today before this magnificent home is snapped up. 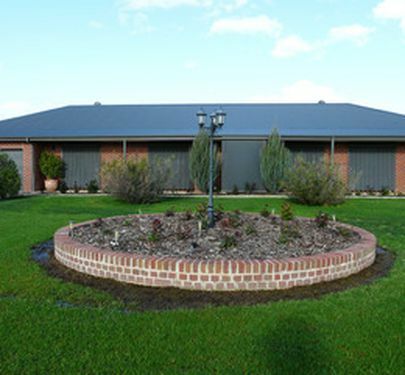 Large brick family home on a 1020m2 fully fenced block. Separate lounge with modern open plan kitchen, dining and family room. Master bedroom with ensuite and WIR. 4 bedrooms with built-in robes plus a study. Double garage and a 6.5m x 9m shed/workshop/man cave! Great undercover outdoor entertaining area overlooking large backyard. Ducted gas heating and evaporative cooling systems. Room for all the family and the toys! 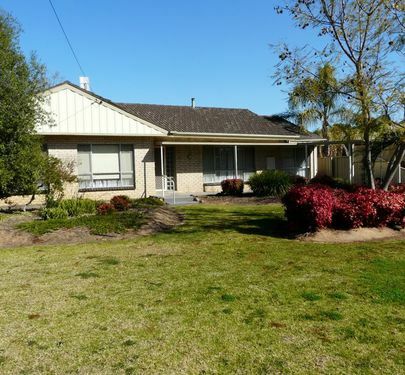 Solid 3 bedroom plus study brick and tile home on a beautiful garden oasis. Beautiful established gardens with front and rear sprinkler systems. 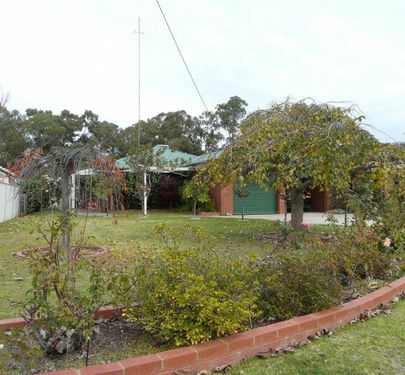 Beautifully presented 4 bedroom brick veneer home in sought after location in Tocumwal. • 2 car lock up garage with remote control. Easy to maintain gardens with front and rear sprinkler systems, established trees creating plenty of shade for outdoor entertaining. An inspection is a must for this property - a true delight! We have the home for you. 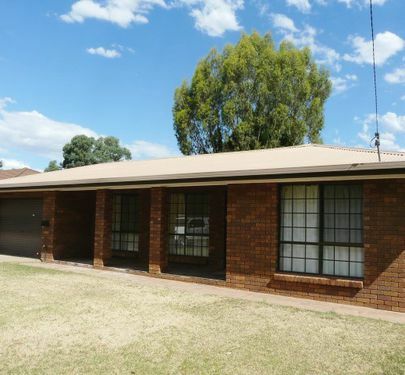 Solid 3 Bedroom brick home with ensuite, walk in robes in all 3 bedrooms, recently renovated bathrooms, spacious kitchen with electric cooking, access to large activities room or second lounge, 3 separate split system air conditioners and ducted natural gas heating throughout. Outside has rear laneway access through double gates, a huge 12x6m shed plus a single car garage with remote roller door and access to inside. Located in a quiet, desired part of town close to all amenities, this home has everything you need. Contact us for further information. Located in a quite street, this family home comprises of 5 bedrooms and 2 bathrooms over 2 levels with everything you need for your family. Not only is there a 6x6m outdoor entertaining area, but there's TWO man cave's - both sheds have power, water & concrete floors - one is 4x8m and the other 8x9m. 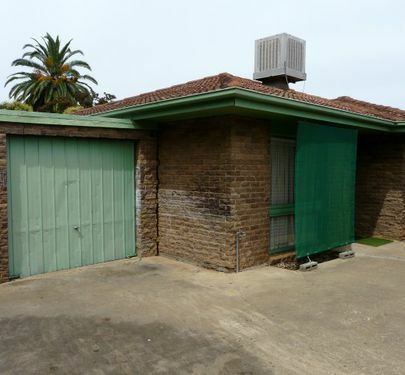 Move in ready home - 3 bedroom brick veneer on large 1,000 m2 block. Ducted evaporative cooling and split system heating. Ideally suited to the tradesperson. Large 14.6 x 7.7m L/U shed, concrete floors. Divided into 2 separate areas, workshop and mancave. An inspection will truly surprise! 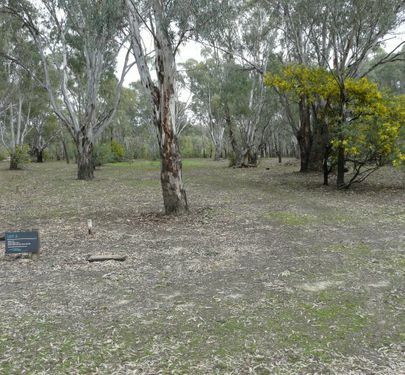 A very rare 3600m2 town block with all services available in a quite area close to Tocumwal town centre and Golf Course - here's an opportunity to build your dream home with plenty of room for privacy, a pool, extensive landscaping or the lot. An existing old homestead for demolishing has Murray River Pine lining some of the internal walls for those who love to recycle. Alternatively, you could consider to sub-divide subject to Council Approval. Don't hesitate - a block like this is hard to find. 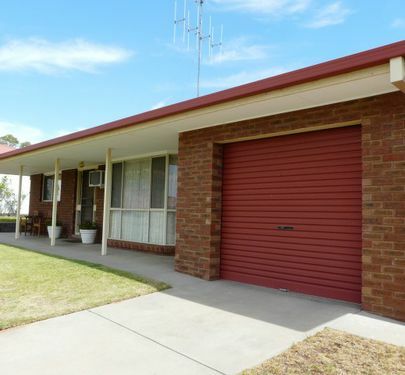 Well presented 3 bedroom brick veneer home on a large 780m2 block in a quiet court within walking distance to both the Golf & Bowls Club and to Tocumwal's main street. The home consists of ensuite and large wardrobes in the master bedroom, central kitchen with electric cooking and dishwasher, main lounge combined with dining plus separate sitting area/small lounge off kitchen, spacious bedrooms with built in robes, ducted evaporative cooling throughout and a large gas log heater in the lounge. 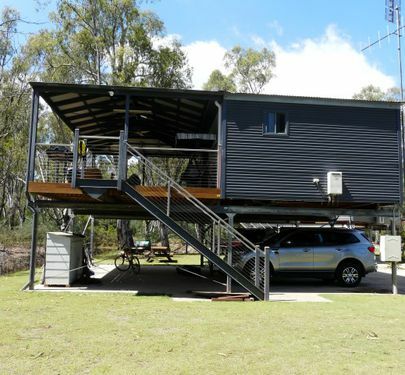 Outside offers a 6x6m outdoor entertaining area, a 3x4m garden shed with concrete floor, easy low maintenance gardens, 2 car garage with remote roller door and a 2kw solar system to assist in keeping those bills at a minimum. 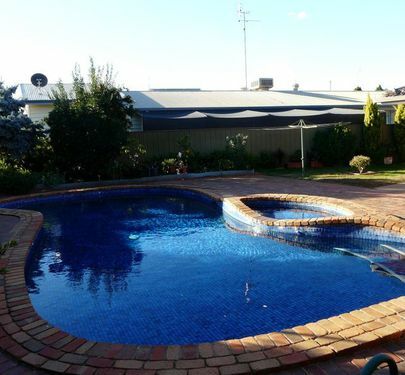 At this price this beautiful property won't last long so get in quick and call us today. 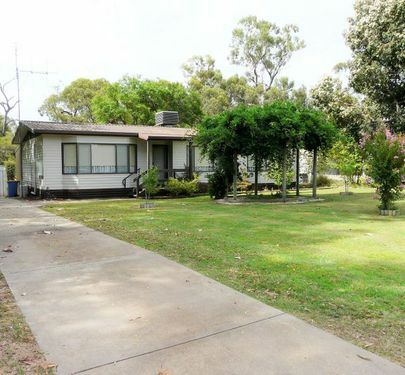 3 Bedroom vinyl weatherboard home on a leafy 1,000 m2 block with a reserve at the rear. Relax on the elevated deck and enjoy the peace and quiet. • Kitchen with electric cooktop and oven. Rangehood. 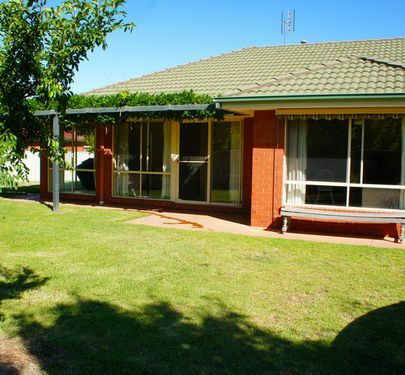 • Manicured lawns and gardens with front and rear sprinkler systems. 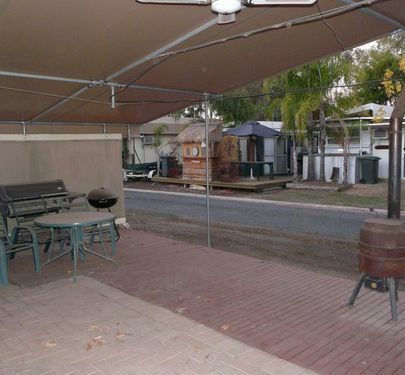 • Backyard great for entertaining friends and family - even a cubby house for the kids! 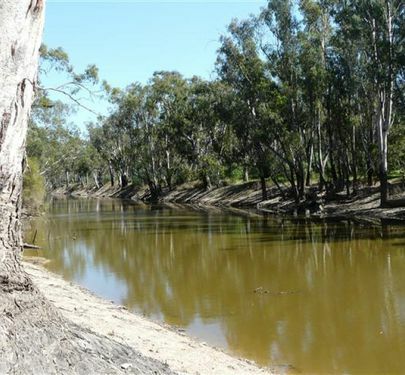 Only one street south of the main street & 100mts to the mighty Murray River. Ducted evaporative cooling & Natural gas heating will keep you comfortable in all seasons. Solar panels to save your electrical bills & a solar hot water system. A bay window above the sink will make sure all your herbs will thrive in the glasshouse type enviorment. There is lots of storage, with B-I-R in both of the generously sized bedrooms. Outside has the benifit of not one but two garden sheds. We are happy to show you this hidden gem at a time of your convenience. A beautifully presented one bedroom unit, kitchen comprises of electric cooking and enough room to move, built in robe and ceiling fan in the bedroom, reverse cycle heating and cooling, and a small private courtyard to ponder your thoughts.Only $205,000Unlimited access to the inground pool and gorgeous BBQ area. 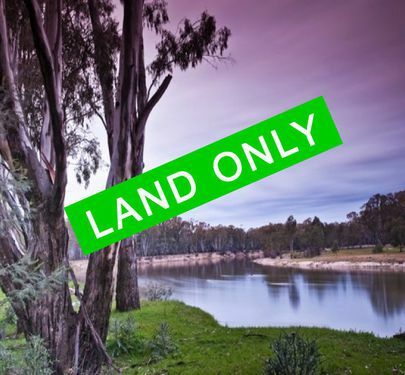 Looking for the ultimate block of land, well look no further, this 3984m2 block of land has Murray River frontage, all services connected, sealed roads and is only a couple of minutes from the main street of Tocumwal. 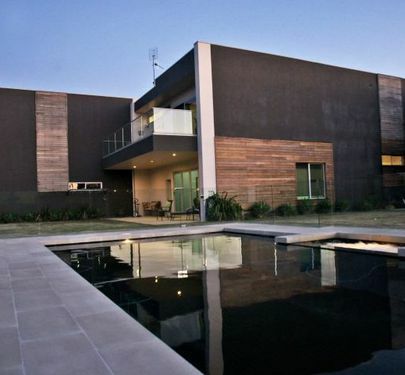 The estate, known as " The Riverfront " Lifestyle on the Murray, has a common area which includes a swimming pool and tennis court and your property can only be accessed by a code to enter through the gates. Do not let this opportunity go for you own piece of paradise, call our office today for an inspection on this fantastic block. 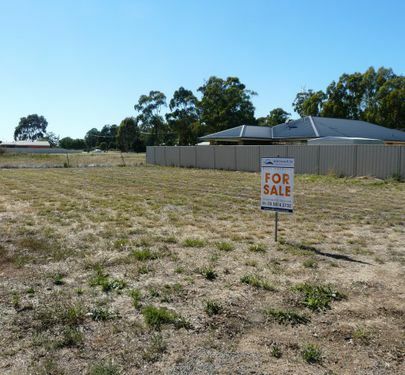 Vacant 1548m2 block of land situated close to town. 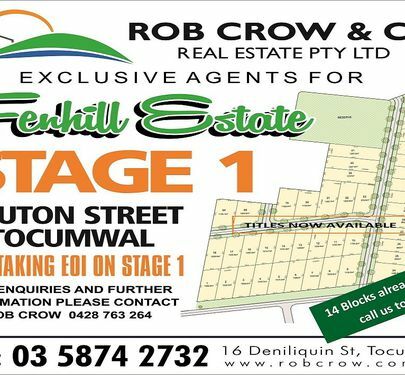 Leisurely walk along "The Creek Walk" to all Tocumwal has to offer including the Murray river, shops, restaurants, golf and bowls club and sporting fields. Water, electricity and gas available to site. A Home with more than expected! 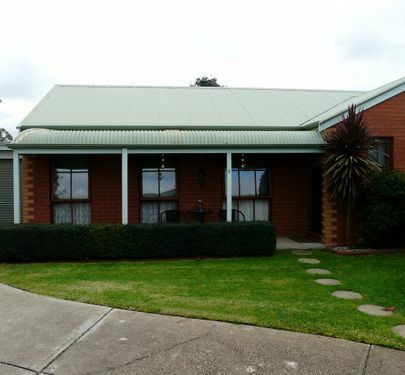 - 6.5% RETURNGreat entry level, with a fabulous tenant who wants to stay long term. Situated in a good area, this property will return approx. 6.5%, or indeed live in it yourself. 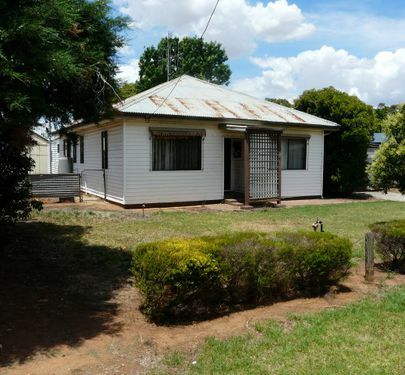 Comprising 2 bedroom, good size lounge, all electric kitchen, ducted evaporative cooling, gas heater, lock up garage, carport and covered outdoor entertaining area, as well as rear lane access. What a great home to start your independence, your first investment or add to your portfolio. Call now for an inspection. 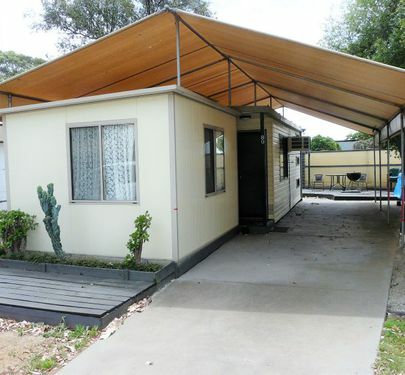 This neat little 3 bed roomer would be ideal project for the handyman to renovate.It has a double carport and large 10x8m lockup shed accessible via rear lane.Great established trees give the backyard plenty of natural shade, perfect for a large entertainment area.The home has good open plan living/kitchen area, there are 3 good sized bedrooms and a fourth room off the lounge area ideal for office/kids room.There are 2 bathrooms both with shower, toilet and vanity units.Located on a large 840m2 block close to main street and yet quiet area.All this at an attractive price, feel free to call us for an inspection. Semi-Rural Land on the outskirts of town! 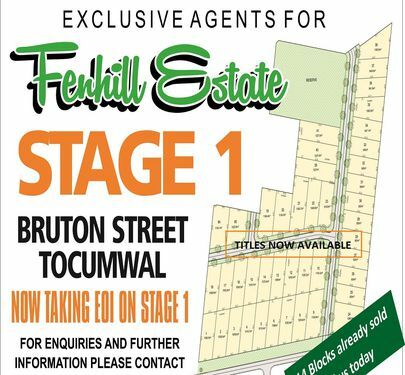 Nestled close to the beautiful Murray River, Fenhill Estate blocks are being snapped up quickly! 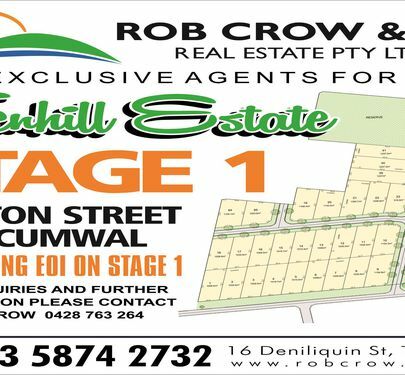 Available now, these large building blocks are ideal for families, an upgrade to build your dream home and retirees to kick back and enjoy Tocumwal and region. Large blocks - 14 sold! 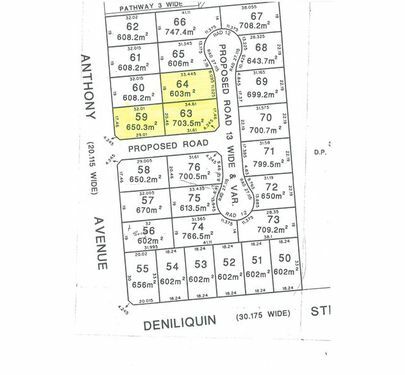 709.2m2 block of land at the end of a court. Located close to town in a new estate. All services available including Natural Gas, Town water, Sewerage, Bins and Phone. What a great place to build your next home. A much sought after CORNER allotment, Lot 63 affords you the opportunity to easily enter the rear yard, via a side gateway. Plenty big enough for your personalised home and also for a boat, caravan or trailer. Take advantage of this and call now for further info. 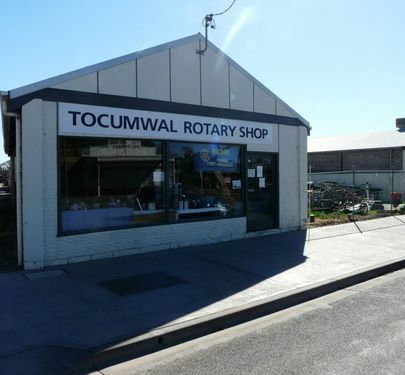 Located 5 minutes from the main street of Tocumwal. 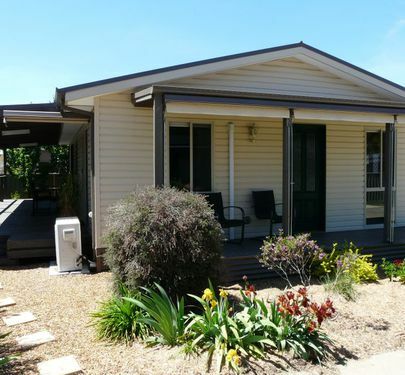 • Fully furnished 2 bed cabin with annex in Murray Riverside Village. 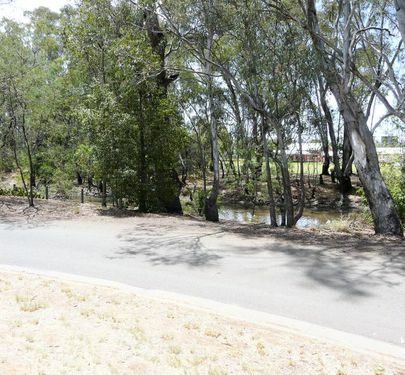 Murray Riverside Village offers full access to the boat ramp, fuel station, swimming pool, tennis court and oval.